Werewolf pits friends vs. friends, family vs. family, and werewolves vs. villagers. 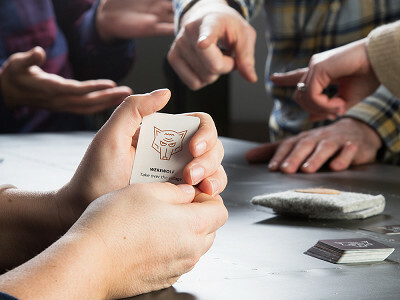 In each game, two players are designated as werewolves, who try to hide their identity from the other players, while picking them off one by one. Werewolf is based on Mafia, a cardless game from Soviet Russia. Boulder-based designer Matthew Sisson encountered it one night (at 3 a.m.) while at South By Southwest. Matthew, like many who’d played the devious game before him, loved it instantly. But he also saw a chance to improve the action. First, he designed a deck of 20 handsome cards, solidifying gameplay and making it easier to learn. And he included all-new characters (like the doctor and the seer) with special powers. These new roles boost the game’s strategic depth, and offer additional opportunity for evil and trickery, making the outcome more unpredictable than ever. Each Werewolf deck comes in a wool felt carrying case (it looks and feels like real werewolf fur! ), making it easily carried to parties and get-togethers. Especially ones where you want to deceive and backstab your friends. Hi everyone! 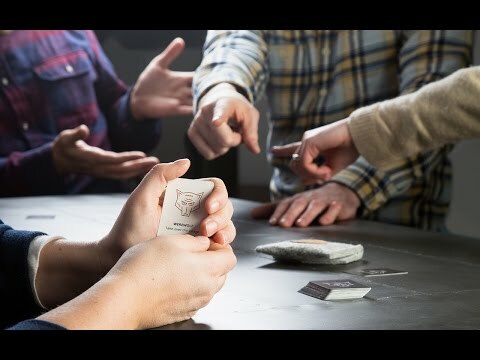 I'm Matt, the creator of the Werewolf Card Set. I'd be happy to answer any questions you have about this fun party game. What are the limits on number of players? Minimum/maximum? Hi Jim, thanks for the question. Werewolf is set up for 7-14 players. @Mike , I believe you have 20 or more cards -- so some cards are not distributed, or some people get multiple cards if it's for 7-14 players? The reason I ask is that I'm looking for a game for 20 people (a class). Hi Jennifer, you can certainly play with up to 20 players, 7-14 is just the ideal range. With large groups of 16 or more, you can make it more interesting by bringing in a third werewolf and replacing one of the villager spots. @Mike , Thanks! I'm definitely buying a game! @Jennifer If you're getting it for a class, you might want to look at Ultimate Werewolf from Bezier Games, which is $2 more, but allows up to 75 players. Hi Jennifer, it really depends. If the werewolf in your game is terrible at lying it can take a few minutes. At most though, it should be about 30 minutes. There is a moderator as part of the game to help move the rounds along. What is the appropriate age range? How is this game different from "Are you a Werewolf?" from Looney Labs? Or Ultimate Werewolf, from Bezier Games? Hi Teresa, the main differences are the player roles and the travel simplicity. In "Are you a werewolf?" there is no witch or doctor characters which add interesting wrinkles to the game. And with the small carry pouch, it is easy to bring it to parties. Travis, Ultimate Werewolf certainly lives up to its name and is really on a different level. This sort of combines the numerous characters from Ultimate Werewolf with the ease of play as Are You a Werewolf? It's a nice compromise for bringing to parties so that it isn't incredibly complicated to explain. Ah... Never mind. My tablet finally loaded the extended description above. Looks like some nice additions. @Teresa Hey Teresa! It's similar, actually. Our version took a different approach to the design as well as created a travel carrying case since we were always playing while camping, at conferences, etc. Also looks quite similar to Werewolves of Millers Hollow. Any major differences there, apart from the design/carrying case? @Stacy Hey Stacy! We introduced several new character cards as well! Is it possible to play with less than 7 players? Oh and I assume you include instructions..
Hi Elizabeth, yes, there are instructions. You can definitely play with fewer than 7 players you just might want to tweak the character cards in the game to even things out. For instance, maybe just one werewolf instead of two. @Mike @Elizabeth To be a bit more specific, all the rules are located on the Werewolf website. We wanted to take a different approach to instruction booklets and make them easily available for anyone playing (and updating! ), so the entire rules section is mobile phone friendly. You can also print them out at home if you're keen on physical instructions too. could you please explain more about HOW the game is played.........cards passed out?......then what? sorry .... found it at above site! Werewolf pits friends vs. friends, family vs. family, and werewolves vs. villagers. 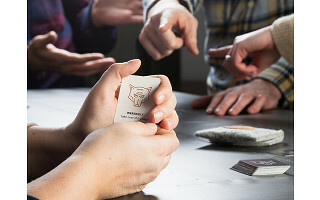 In each game, two players are designated as werewolves, who try to hide their identity from the other players, while picking them off one by one. Werewolf is based on Mafia, a cardless game from Soviet Russia. Boulder-based designer Matthew Sisson encountered it one night (at 3 a.m.) while at South By Southwest. Matthew, like many who’d played the devious game before him, loved it instantly. But he also saw a chance to improve the action. First, he designed a deck of 20 handsome cards, solidifying gameplay and making it easier to learn. And he included all-new characters (like the doctor and the seer) with special powers. These new roles boost the game’s strategic depth, and offer additional opportunity for evil and trickery, making the outcome more unpredictable than ever.